Your doctor will look for high blood pressure , known as hypertension. This condition can put stress on major organs and blood vessels. Over time, high blood pressure can cause permanent damage. 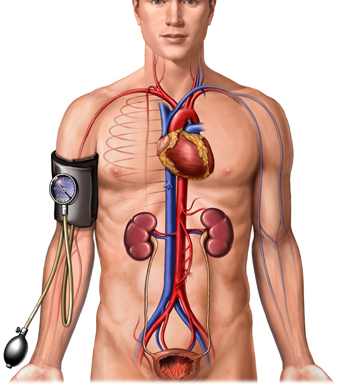 Your doctor may also look for abnormally low blood pressure, known as hypotension . This may limit blood flow through tissues and organs of the body. This can also be harmful. Explore high blood pressure. National Heart, Lung, and Blood Institute. Available at: http://www.nhlbi.nih.gov/health/health-topics/topics/hbp/. Updated June 10, 2016. Accessed February 26, 2018. Understanding blood pressure readings. American Heart Association website. Available at http://www.heart.org/HEARTORG/Conditions/HighBloodPressure/AboutHighBloodPressure/Understanding-Blood-Pressure-Readings%5FUCM%5F301764%5FArticle.jsp. Updated February 19, 2018. Accessed February 26, 2018.